I talk a lot about the health benefits of drinking raw cow’s milk or raw goat’s milk on this blog. But for those of you that cannot tolerate it, or who cannot obtain pasture-fed raw milk where you live, an excellent alternative is Raw Almond Milk. With raw almond milk, you can still enjoy cereals, porridge, milky tea, smoothies and all the other nice things you really miss out on when you can’t use raw dairy. Unfortunately, most commercial brands contain thickeners, like carrageenan, or oils (which may not be cold-pressed and completely free of rancidity). The solution (especially for those with sensitive digestive systems) is to make your own. 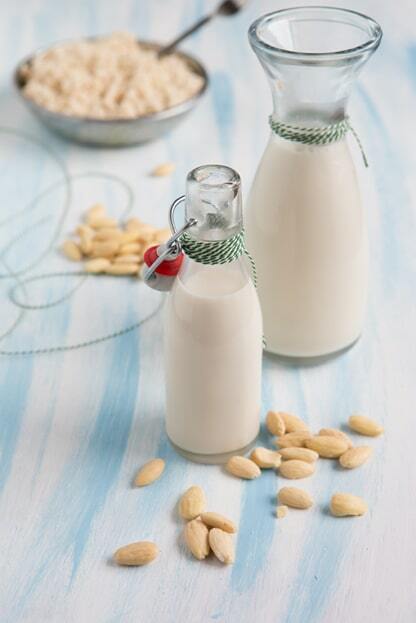 Dr. Ben Kim (and his wife Margaret) have posted this excellent pictorial instruction on how to make yummy, fresh, raw almond milk. You won’t believe how easy and quick it is! Just remember to use raw, unpeeled almonds (preferably organic). If you don’t want to use dates as a sweetener, you can always use stevia, or raw honey. You state that whenever you use other luiqids than water it is not elemental anymore, but is this bad for someone that’s trying to go in remission? I find the use of water for the elemental shakes disgusting, so I would like to try homemade almond milk. Would that be okay? If not, why not?